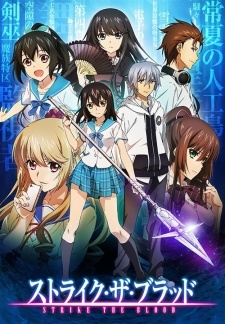 Here are my top picks for similar anime like Strike The Blood! Keep in mind the list is in no particular order. Enjoy! Godō Kusanagi is a 16-year-old high school boy, who once killed the god “Verethragna” and acquired the title of “Campione” (“God Killer”) when he was 15. Erica Brandelli is a 16-year-old Italian girl, who is a “Great Knight” of the magic society “Bronze Black Cross” and had fought together with Godo to defeat Verethragna. Godo doesn’t like fighting but his title of “Campione” makes him get involved in battles against other Campiones and uncontrollable gods. Kamijou Touma is a student living in Academy City, a highly advanced place in terms of technology. Despite being gauged as a level zero esper (no powers), he possesses on his right hand the Imagine Breaker, an ability that negates any power whatsoever. Touma finds a young girl named Index who is trying to run away from Necessarius, a powerful magic organization that she is member of. Blessed with the skill of memorizing any sort of information, she holds 103,000 forbidden magical books within her head. As science and magic cross paths, Touma must face several dangers amid espers and magicians who appear at the exciting scientific town. In the “Great Disaster,” Japan has been thrown into chaos by onmyouji (a kind of magician). Harutora Tsuchimikado was born into an onmyouji family, but has no power whatsoever. His childhood friend Natsume (another member of the Tsuchimikado family) appears to him one day to take him up the promise he made long ago to become her shikigami (familiar). A battle between onmyouji is about to begin. The story of “love, magic, and battles” revolves around Akuto Sai, a boy who aims to become part of his country’s highest order of magicians and contribute to society. On the day he is admitted into the Constant Magical Academy, his aptitude test predicts the following: “Future Occupation … Devil King.” Thus begins his difficult school life in which he is resented by his studious female class head, desired by a girl with mysterious powers, and guarded by a beautiful female android. That awkward moment that you put the same show on the list twice….